As promised, here is the BTS blog containing all the rules for the new magic phase. Sadly, due to several different reasons, it got delayed (it was mainly my (@Kathal) fault, so blame me and not the other guys), however, better late than never, right? We have divided the structure of this BTS blog into two parts. The first outlines the magic rules, while the second will deal with the Paths of Magic (expect around 6-10 days delay), since you HAVE TO READ the magic rules first before being able to understand the changes done to the Paths. Lets kick of the blog with the most fundamental question: Why the changes to begin with? Variance in the Magic Dice generation. We all know those games when you never generate more than 6 power dice but the enemy is on a hot streak with 9+ every turn. Fundamental flaws in different aspects, such as Bound Spells. Background-driven design (the background explanation can be found in the Full Magic Path document: link to the download) which renders the current system meaningless. Design a fun, diverse and background driven magic phase, which lowers the randomness to the previous (1.3) magic phase while enabling all sorts of magic set-ups (from no magic investment to "high end" magic investment). Furthermore, it needs to be balanced. While there were a lot of great suggestions and ideas in those proposals, it would have been impossible to implement all of them. 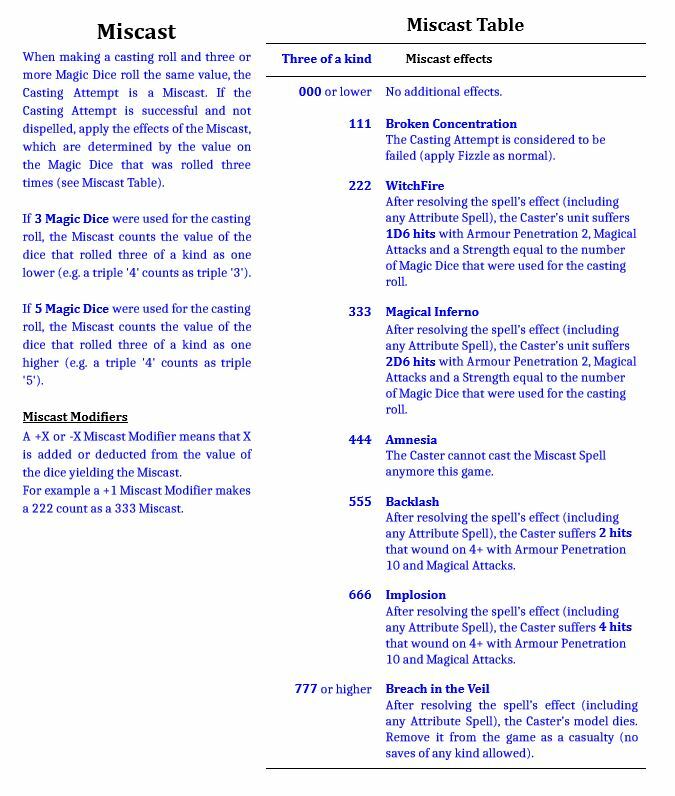 That being said, several concepts for magic dice generation, Wizards "levels" and Bound Spellsfound their way into the Second Edition Magic Phase. Previously there were only 2 types of Wizards: the "Apprentice" and the "Master". 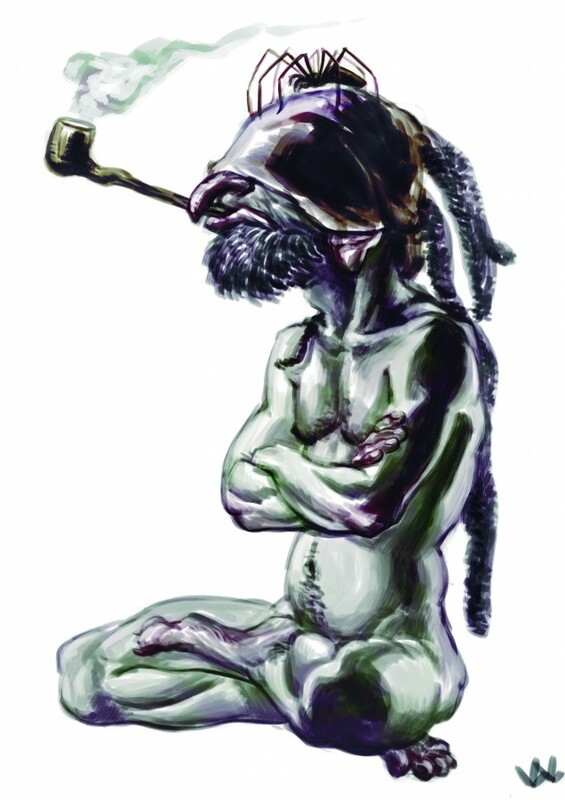 Now, there is a third type of Wizard, the "Wizard Adept" which is somewhere in between the Apprentice and the Master. Each type has slightly different rules and also generates their spells in their own way. Also, just because there exist now three types of Wizards, does not mean that all armies will have access to all three types. 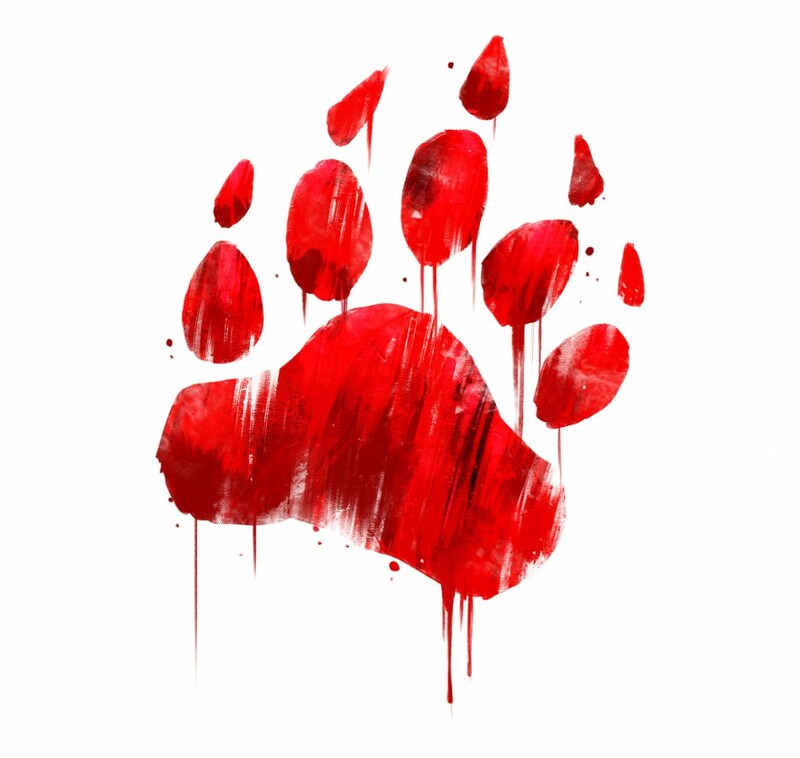 Some armies might only have access to the "Apprentices" and "Masters", while others might not have an "Apprentice" option at all and instead have the "Adept". This depends on the background of the army. "Wizard Apprentices" are the least powerful of the wizards. As a result, they are also the cheapest wizards to field. An Apprentice only has access to one spell. "Wizard Masters" are the most powerful and also experienced Wizards out there. This is both reflected in their flexibility as their cost. A Master has access to four spells, has "Channel (1)"* and grants a +1 casting bonus for spells. *"Channel" got completely reworked, it will get explained later on. As we can already see, both the casting as the dispelling bonus from Wizards for spells have been reduced. Only the Wizard Master grants a casting bonus of +1, and other two Wizard types none at all. The dispel bonus is completely gone. This evens out the magic defence for armies between low to no magic investment and high magic investment. 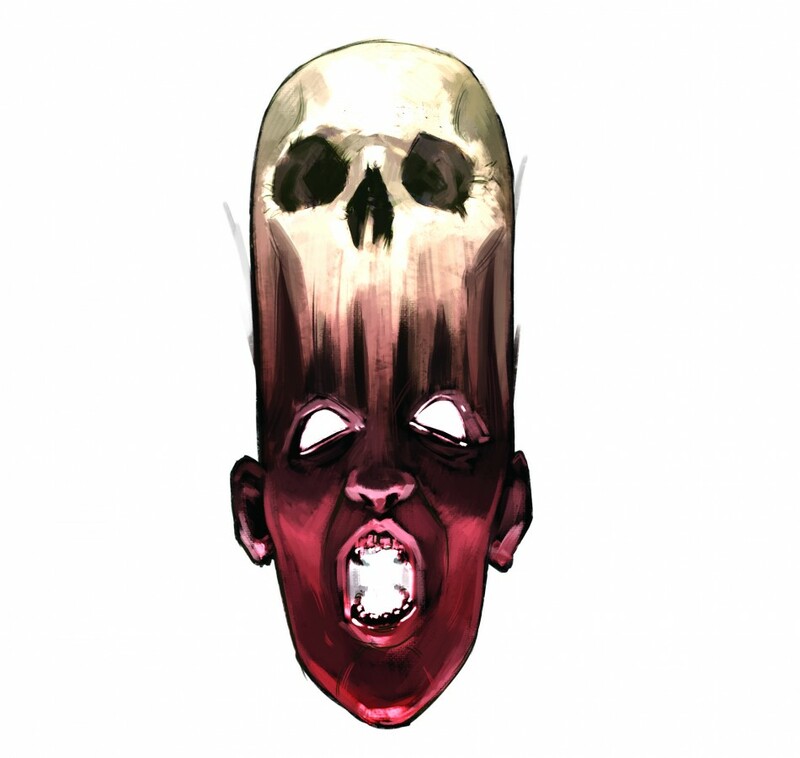 Previously the "Aether Icon" and the "Crown of Scorn" were the band aid enabling some parity. As a direct compensation, the casting values of all spells went down. 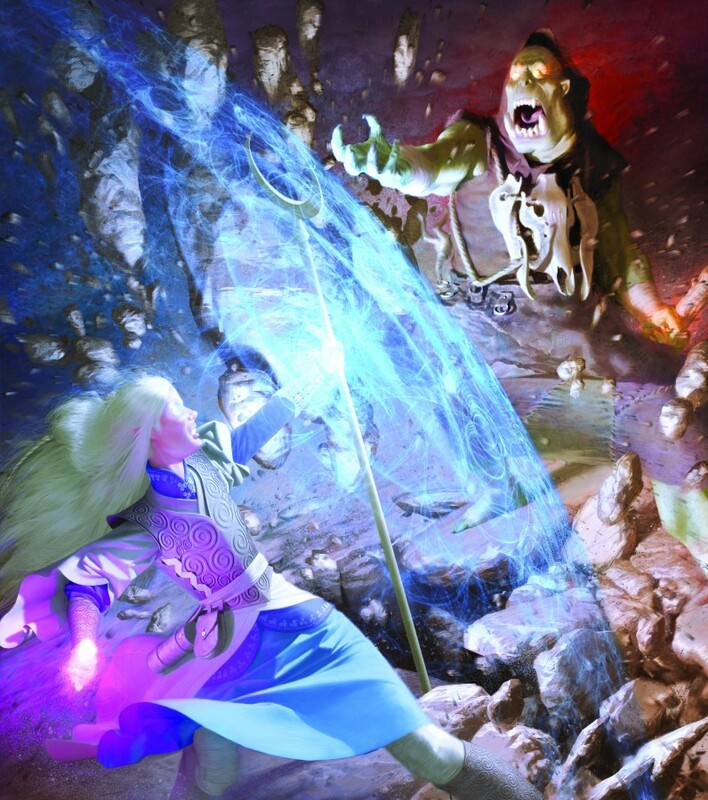 The Spell selection was one of the most criticized points of the old Magic phase, since it typically resulted overinvestment into the magic phase just to have usable spells. The aim of the changes done here is to both reduce the randomness and to make different magic set-ups more appealing (so no default spamming of Wizard Masters). *The Hereditary Spell is a unique, background designed spell for each army. Some ACS have already published their respective Hereditary Spell, so go check it out! No random spell generation anymore! However, as a trade off, one cannot have every combination of spells on a single Wizard. This results in a dynamic where two Adepts might reap more benefits than a simple Master due to their flexibility even though they do not offer a casting bonus. On the other hand, playing multiple Wizard Apprentices gives access to more "Dominant" items (aka old Arcane Artefacts) and it allows more crucial Hereditary spells (*looking at you Evocation of Souls*). As testing has shown, this results in a lot of different and very unique magic set-ups, from 1 Adept + 2 Apprentices to the lone standard Wizard Master. Every (usable) combination of magic set-ups has been tested and found to be good, or at least reasonable (4 Wizard Apprentices didn't really work though ). While you can have the same spell multiple times with different Wizards, to prevent spam, each spell can only be attempted to be cast once. Bound Spells, Attribute Spells and spells with "Replicable" (being able to cast it more than one time per turn) ignore this restriction. Now that we know what types of Wizard will exist and how they generate their spells, lets address how we generate magic dice. Flux Cards and "Siphoning the Veil"
Previously, dice generation were randomized using dice. While a random factor is still in the new system, several steps have been taken to lessen it, making the phase overall more fair to both players and also enabling resource management by introducing a "storage system". In the 2.0 magic phase, instead of rolling dice to determine how many Magic Dice the players have available, there is a deck of 8 "Flux Cards". At the beginning of the magic phase, simply draw one randomised flux card from your deck. This card determines how the number of Magic Dice as well as Veil Tokens (a secondary magic resource) the players receive. Once a Flux Card has been drawn, it gets discarded and thus cannot be drawn again. Furthermore, the "Flux deck" is open information for both players. Hence, probability becomes a factor in the following turns. As mentioned previously, "Veil Tokens" are the second magic resource and also the "storage system", which interacts with "Siphon the Veil" and "Channel". The Active Player creates a new pool of Veil Tokens. The main sources are Flux Cards, models with Channel and Veil Tokens saved from the Active Player's previous Magic Phase. These Veil Tokens can now be turned into Magic Dice for a cost of 3:1 - 3 Veil Tokens for 1 Magic Dice. To do this the Active Player removes any number of Veil Tokens from their pool. For each full 3 Veil Tokens that were removed, the Active Player adds a Magic Dice to their Magic Dice Pool. Up to 4 Magic Dice may be added to the Active Player's pool this way. Afterwards, remove Veil Tokens in the pool until it contains no more than 3 tokens. The remaining Veil Tokens are saved to be added to the Veil Token pool in the Active Player's next Magic Phase. This means, that thanks to the rule "Channel" every Wizard excluding Wizard Apprentices generate X Veil Tokens to the amount of "Channel (X)" they have. In return, Veil Tokens can either be stored for the next Magic Phase or turned into Magic Dice. This enables different combinations of Wizards and potential Exotic Artefacts (aka Magic Items) reap a different benefits from the Veil Tokens. 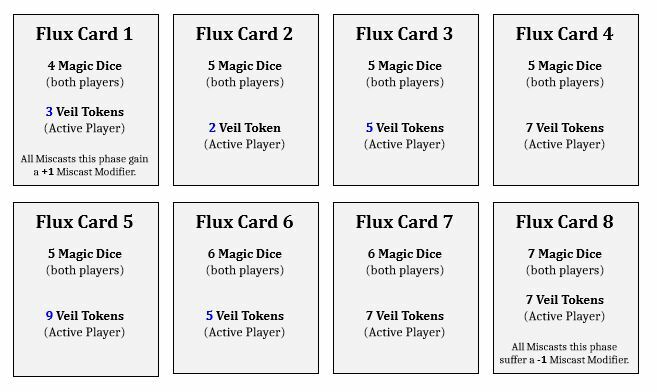 Some set-ups thrive with 4 or 7 Veil Tokens from the Flux Cards (for example with "Channel (2)" - 1 additional dice for those magic phases), others thrive with anything but 7. Furthermore, by being able to store up to three Veil Tokens a player can bank his/her magic phase this turn for a stronger magic phase next turn. However, players are still limited to 4 additional dice, which makes "Channel spam" and/or overloading on a single magic phase rather hard to do. This allows armies to design magic items or Racial Traits, which can interact directly with the Veil Tokens, by either changing the limit that can be stored or using it as a resource ("boosting" your spells with them). Overall, these changes make the magic phase more fair to both players while the storage system for Veil Tokens introduces more tactical depth. Hence, instead of trying to find THE perfect solution, which would work for every point value, a tailor-made solution for the normal game size (between 4000 and 5000pts) was chosen. Furthermore, as the respective teams hope to support both smaller as bigger games in the future with different supplement packs. After the Wizards, Spell Selection, Flux Cards and "Siphoning the Veil", there are two more key changes left, "Fizzle" and "Miscasts". Fizzle is a brand new rule in the magic phase, which helps mitigate extreme bad luck for both players while not being a foolproof method to abuse. When a Casting or Dispel Attempt is failed, any Magic Dice that rolled a natural '1' are put back in the Magic-Dice Pool from which they came. This does not apply to Casting or Dispel Attempts that fail due to "Not Enough Power"*. Note that this does not apply to passed Casting Attempts that are then dispelled. *"Not enough power" means unsuccessful casting or dispelling attempts with only one die. This should minimize the "feels bad" moments of the magic phase, where a player got already punished by an bad roll. There is little to no need to punish one even harder for this. Similar to the rest of the magic phase, the old Miscast system was heavily criticised by players due to its harshness. Some armies like Elves suffered severely under "Witchfire", while armies like WDG with their ironclad bodies would just laugh about it. Furthermore, there were and still are discussions going on in the Public Forum if Miscast are even necessary. Looking at it from a background perspective (remember, we are doing background-driven design), the Immortal Realm, the source of all the Magic, is toxic for inhabitants of the Mortal Realm. However, the same can be said in the other direction. Hence, working with Magic, which is poisonous, is neither easy nor safe and thus Miscasts are something, which should get implemented into the game. No "Overwhelming Power" anymore, so we do not get an additional bonus when "Miscasting"
Similar to the other aspects of the Magic Phase, Bound Spells in their current form have multiple fundamental flaws. Being able to force through a bound spell risk free and also the option of spam (BH Totems) without a real drawback was an issue. These changes address the two most glaring issues mentioned above, since it removes the risk free "force through" by five dicing a bound spell and also weakens the spam of Bound Spells. However, at the same time, the Power Level can be adjusted freely. Basically there could be a Bound Spell with a relatively high primary value (6 for example) but a lower secondary value (7) which makes the primary casting value similar to a spell cast with 2 dices. Since Dwarven Holds are directly affected by this (their whole Magic Phase is Bound Spell based) it creates ways to balance their Magic Phase by either increasing or lowering the respective casting values. Furthermore, the previous dispelling bonus against Bound Spells (getting +1 by default) is gone due to this changes. The last point is "Remains in Play" spells which have two problems: either they are great or useless. When the opponent also invests into a proper magic phase, they are great, cause either they draw Magic Dice when casting it or ruin the opponent's magic phase, since he is kinda forced to dispel it with his Magic Dice sooner than later. On the other hand, against armies with little to no magic investment, "Remains in Play" spells are completely wasted, since dispelling such a spell in the opponent's Magic Phase is free. After a lot of discussion it was decided, that removing "Remains in Play" spells from the game, would be the best going forward. There is only a single exception for this, which is "The Oaken Throne" from the Path of Druidism. Since the whole Path revolves around this particular "Remains in Play" spell, there was no other real solution to either keep it as it is or rework the complete Path. Since reworking a functioning and good Path was deemed unnecessary, the first solution has been taken. Besides those two, there are a boatload of other smaller changes to the Magic Phase, due to the new rules (most of them just rules updates). However, it wouldn't really make sense to spoiler those, when they are only wording, rules, or layout updates. Most importantly, Casting and Dispelling Spells is still the same. "When four Kings abdicate their thrones, do you really have a Kingdom anymore?" Previous Article Issue 11 - Let it be....Weapons! Just wondering, since the substitute for a Hereditary spell for EOS is choosing a no. 1 spell of another path, how the spell selection works for EOS Adepts and Masters. 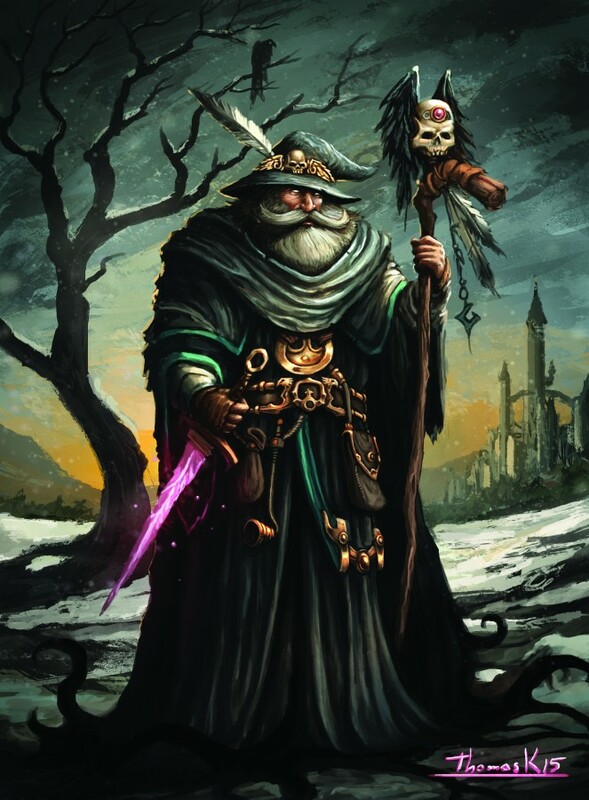 For instance, could a EOS Wizard Adept choose the path of Pyromancy and pick Pyromancy 4 and then use its Hereditary feature to choose Divination 1, thus having a spell combination of 1 - 4 but from different paths? No idea, it purely depends on the final wording. Can you still dispel remains in play (oaken throne) spells as previously? Sounds very solid, I really like the mindset behind the design. Thanks devs! Well, I for one welcome our new wizards overlords. Really dig the new rules, very well thought & balanced, congrats to the rules team. I was glad to have contributed a little among all other proposals and be a small part of this with everyone. Great job, i also love the pictures. May RNG(j)esus rest in piece. I think the flux cards should have names instead of numbers. Something along the lines "rip", "tear", "mend" and such, showing the veil as a fabric between the realities. It makes remembering the effects easier as well, as you will have a direct vision of what is actually happening, deepens immersion and can be a great way of implementing art into the cards as it shows a vivid image of what is going on during the phase. nice idea, and would also add "background" to the veil "event". Like "low tide", or "overwhelming".. The background team is aware of this "request" (to say it this way), however, it will take some time to find proper names. Though, sounds very Dwarfish if you ask me.